﻿Trading ﻿cards ﻿and ﻿stickers ﻿have ﻿been ﻿around ﻿for ﻿many ﻿decades. ﻿In ﻿the ﻿1960s, ﻿cards ﻿and ﻿stickers ﻿with ﻿Marvel ﻿characters ﻿were ﻿released ﻿and ﻿continue ﻿to ﻿be ﻿released ﻿today. ﻿The ﻿first ﻿Doctor ﻿Strange ﻿stickers ﻿were ﻿released ﻿in ﻿1967 ﻿as ﻿part ﻿of ﻿the ﻿Philadelphia ﻿Gum ﻿promotion. ﻿There ﻿were ﻿two ﻿Doctor ﻿Strange ﻿stickers ﻿in ﻿this ﻿release. 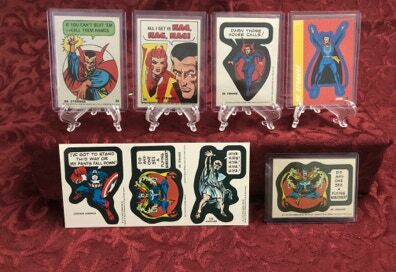 ﻿In ﻿1975 ﻿and ﻿1975 ﻿two ﻿more ﻿Doctor ﻿Strange ﻿stickers ﻿were ﻿released ﻿for ﻿Marvel ﻿Chewing ﻿Gum. ﻿From ﻿the ﻿1970s ﻿to ﻿today, ﻿Doctor ﻿Strange ﻿regularly ﻿appears ﻿in ﻿Marvel ﻿trading ﻿card ﻿series. ﻿In ﻿recent ﻿years, ﻿original ﻿art ﻿cards ﻿have ﻿been ﻿included ﻿in ﻿trading ﻿card ﻿series. ﻿The ﻿Doctor ﻿has ﻿had ﻿many ﻿original ﻿art ﻿cards. ﻿Some ﻿can ﻿be ﻿acquired ﻿for ﻿as ﻿little ﻿as ﻿$20 ﻿while ﻿others ﻿command ﻿hundreds ﻿of ﻿dollars. ﻿This ﻿section ﻿of ﻿the ﻿Archive ﻿features ﻿trading ﻿cards ﻿and ﻿trading ﻿card ﻿type ﻿stickers. ﻿It ﻿also ﻿includes ﻿game ﻿cards ﻿from ﻿such ﻿games ﻿as ﻿the ﻿Vs ﻿System ﻿and ﻿the ﻿Legendary ﻿card ﻿game. ﻿As ﻿well ﻿as ﻿any ﻿original ﻿art ﻿cards ﻿in ﻿the ﻿collection. ﻿To ﻿view ﻿other ﻿types ﻿of ﻿collectables ﻿in ﻿the ﻿Archive, ﻿use ﻿the ﻿menu ﻿above ﻿to ﻿navigate ﻿to ﻿other ﻿pages.